A beautiful and eccentric artist and her four-year-old adopted daughter are murdered on a local farm, and angry white farmers point to her enigmatic Bushman farm manager as a key suspect. Along with Ghaap and Pyl, Beeslaar is plunged into the intrigue and racial tensions of the community and finds that violence knows no geographical or ethnic boundaries. 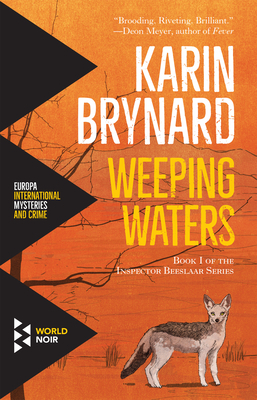 Karin Brynard is a former political and investigative journalist and uses her research skills and eye for detail to fascinating effect in Weeping Waters. She is, today, one of Penguin South Africa's biggest authors. Maya Fowler is a novelist, editor and translator living in Cape Town, South Africa. Her debut novel, The Elephant In The Room, (Kwela, 2009) was shortlisted for the Herman Charles Bosman prize. Isobel Dixon was born and educated in South Africa, and in Edinburgh where she completed Master's degrees in English Literature and Applied Linguistics. She has translated novels from the Afrikaans and her debut poetry collection Weather Eye (Carapace, 2001) won the Sanlam and the Olive Schreiner Prizes in South Africa. Dixon is Head of Books and a Director of the Blake Friedmann Literary Agency, where she represents writers from around the world, among them Sunday Times and New York Times bestsellers and international prize winners.